Pacific School's mission is to prepare children for life through experiential learning that addresses the needs of the whole child. We create a safe and secure school environment that promotes social and academic growth and develops an enthusiasm for learning, a positive self-image and cross-cultural understanding. The staff of Pacific School is dedicated to addressing the needs of the whole child by creating a school environment wherein every child may experience success in social and academic growth, as well as develop enthusiasm for learning. Children learn to cooperate and take responsibility for their actions. They learn to function with a sense of community while maintaining individuality and creative self-expression. They are treated with kindness and respect, and learn to respect others. The multi-graded classroom environments allow children to become active participants in their own learning process. Pacific School strives to give each child a lifelong appreciation of learning. Our rich educational environment provides every student with a broad foundation of knowledge and practical experience. The curriculum integrates with California State Standards and is delivered through multi-graded classroom programs. Well-rounded instruction is complemented by a variety of programs, including music, Life Lab, and physical education, as well as visual, performing, and culinary arts. Students develop a sense of community while maintaining individuality and creative self-expression. Our diverse community fosters cooperative skills, mutual respect, and pride in academic progress. 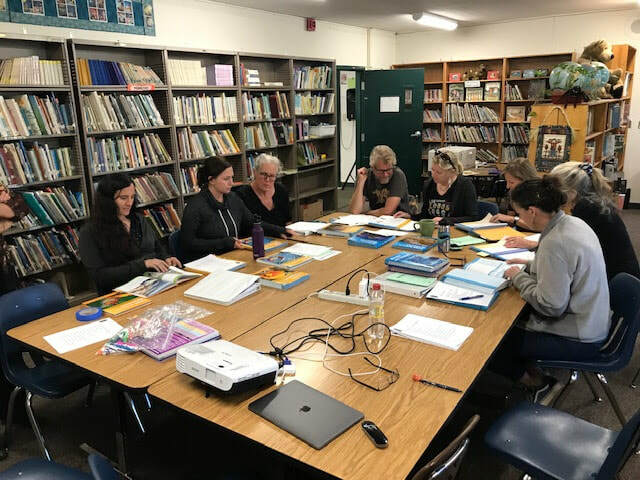 Pacific School teachers and staff discussing the best ways to implement the new California Next Generation Science Standards.